Can you believe November is here already? It’s the point where the silly season starts to hit full steam, but I’ve decided that this year will be different. 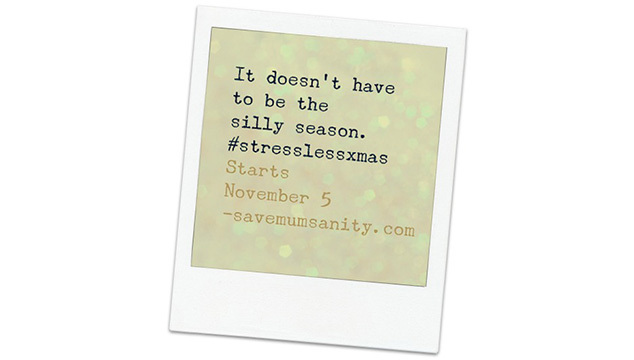 So next Wednesday, I’d love you to come and join in the Save Mum’s Sanity #stresslessxmas. I think as mothers we sometimes bear the brunt of the silliness of this time of year – organising the social gatherings, buying the gifts, endless food prep and we can easily start feeling the stress building in a time of year that should be enjoyable and about sharing love with our family. I personally put alot of pressure on myself to provide the perfect christmas experience and it always leaves me feeling strung out. I figure what my family really needs at Christmas is not a strung out, hung up mother, but a peaceful, relaxed and happy one who’s not worrying about the details so much as the time spent together. So that’s my aim this year, and I’d love if it was yours too! Next Wednesday’s post will have some details about how to get involved and what to expect – I promise not to bombard you with lots of Christmas Stress Less posts, as it will kind of defeat the purpose! I’m aiming for once a week with some social media check ins to see how everything is going. I’m planning on ressurrecting Save Mum’s Sanity Weekly, which will be full of #stresslessxmas tips so if you’re not signed up, you can do so on the side bar. The other exciting news I’d like to share is that Save Mum’s Sanity has been announced as a finalist in the Bupa Health Influencer Blog Awards 2014. I was so shocked to be a finalist I danced around my house saying ‘OMG’ for about an hour. I’m a finalist in the Family Time category, so feel free to pop over and put in a vote for me and have a look at all the other wonderful finalists. It’s really heartening to be recognised as a blog aiming to change to the way we think about health and wellbeing. I’m really passionate about mothers looking after their own needs as a priority, rather than sticking their goals, dreams, sanity and wellbeing on the shelf in the sake of their family. It’s not what your family want or need from you – there’s no such thing as a perfect mother, but lots of amazing, different ways to be a perfectly good one. This is what I want to celebrate and what I want for you. On Friday I had just written a post for A Little Bird about my dilemma on whether to get Santa photos taken this year. Go over and read it, I’ll wait right here, OK? So then Friday night we decided to take an impromptu trip to the city to see our friend’s cabaret troop Betty & the Betties perform and look at the Christmas windows and take a visit to Santa Land at Myer. It was lovely being in the city and soaking up the festive atmosphere. Jarvis was enjoying the sights and the lights and we went up to the top level of Myer to Santa Land, as I’d heard there was a ‘Santa Train’ up there. Jarvis got quite excited about the train ride and lined up and I stood near the fence to wait for his ride. As the ride ahead of his took off, I noticed a photographer work his way along the train taking individual photos of the children onboard. Well Christmas is over for another year.